Recently I have just installed the Ubuntu 12.04 Precise Pangolin on my HP mini 210. The first problem I noticed was my netbook's display brightness is at the lowest level. I increase the display brightness to my preferred brightness level using keyboard shortcuts and 'Brightness and Lock' in Ubuntu system settings but the screen brightness will still resets to the lowest level everytime I start/restart the netbook. The number 7 represents the display brightness level you want. Save and close this file. The range of brightness level is different on different computers. 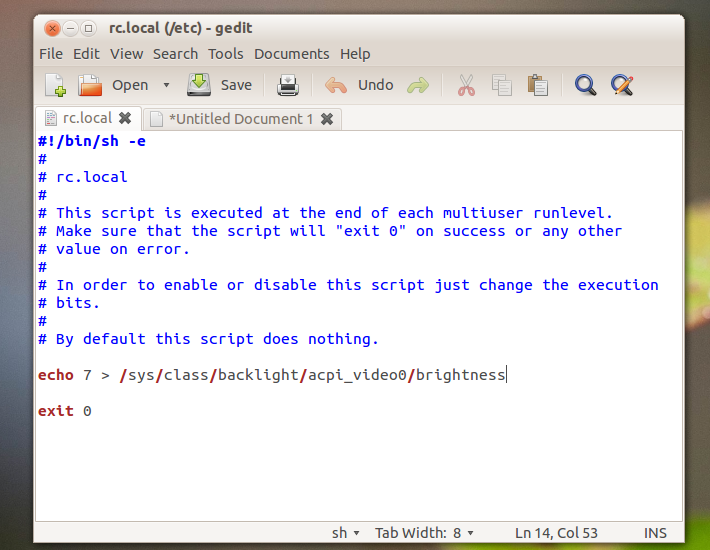 You can check the maximum brightness level for your computer via this path: /sys/class/backlight/acpi_video0/max_brightness. For my HP mini 210, the max brightness is 10. 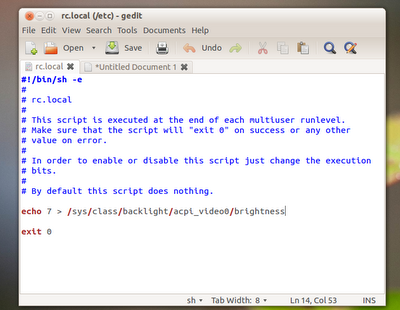 So this means the range of brightness level for my netbook is from 0 to 10. It works on a Dell Inspiron. Thanks, dude! You're welcome. Appreciate your feedback. Thank you! It will be very helpful for other Sony laptop owners. doesn't work on HP G72t a kernel patch fixed it in 11.10 now it is back. Very aggravating. Understood how irritating it could be. What folders do you have in /sys/class/backlight ? I was having exactly the same problem. Your solution was very helpful! Thank you very much! We have same folders in /sys/class/backlight so I have no idea. Wish I could help. No problem. Thanks for the nice feedback. Thank you so much for the fix. This worked on Asus A42J series. Thanks for the heads up. It is very helpful. Hi, thanks for the tips but I got a permission denied if I just echo this code. I've to do this: "sudo su && echo 10 > /sys/class/backlight/acpi_video0/brightness" and then enter my password to make it work. What should I do to avoid this ? It will also prompt me to enter my password for root privilege when I use gksu. I would recommend to use gksu for graphical applications and sudo for command-line applications. This doesn't work on Asus U31SD-XH51. It worked for HP ProBook 4330s.